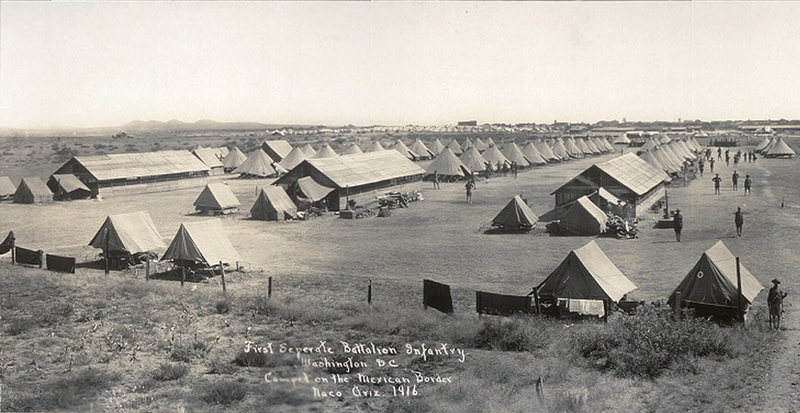 Camp Naco, an encampment of American troops along the Mexican border during the period of “border trouble,” in 1916. 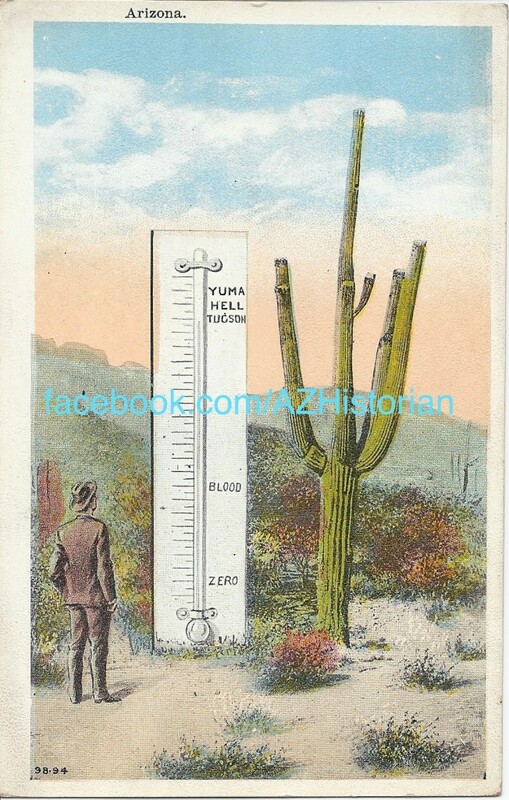 I discussed the 1934 Parker Dam controversy and the resultant birth of the ‘Arizona Navy’ with Nadine Arroyo Rodriguez of KJZZ’s “The Show” last week (clip accessible here: http://kjzz.org/content/11126/did-you-know-arizona-navy-deployed-1934). 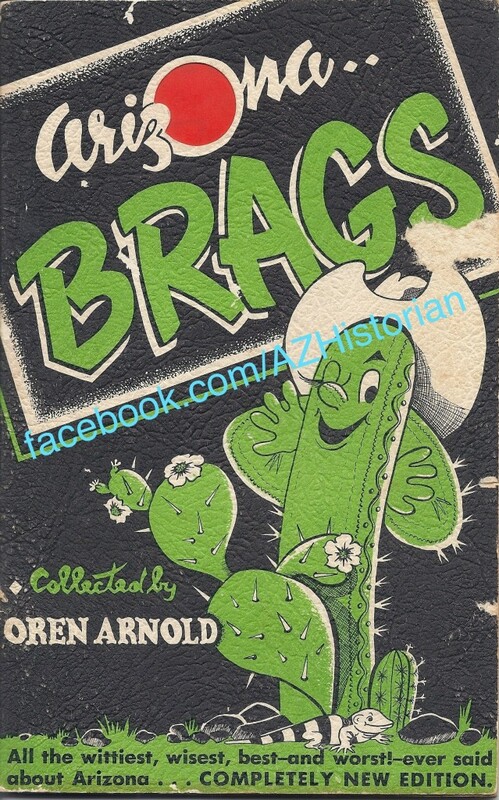 While Arizona’s short-lived two-boat naval force (or is it farce?) makes for a good story, Governor Benjamin B. Moeur’s deployment of the Arizona National Guard was a far more effective display of power. However, this border service, although notable for taking place along an interstate border, was not the first time the Guard received a call to mobilize along a border. The Arizona National Guard, originally known as the Arizona Volunteer Infantry Regiment, or the Arizona Volunteers, was first organized in early 1865. As described in a 1955 Guard-issued history, the Volunteers were raised to “fight the Indians who were pillaging and marauding among the settlers and friendly Indian tribes” of the territory. Since that time, the Arizona National Guard has served with distinction both internationally, as was the case in World Wars I and II, and domestically. The Guard’s 1934 deployment to the California border may well be the Guard’s most-discussed domestic service, but its 1916 mobilization along the Mexican border involved risks far more dire than those faced along the banks of the Colorado River. Indeed, the decade-long Mexican Revolution that began in 1910 brought great risks to towns along the international border, as evidenced by Pancho Villa’s March 9th, 1916 raid of Columbus, New Mexico. Villa’s excursion onto American soil resulted in the death of eighteen U.S. citizens and prompted President Wilson to send General John “Black Jack” Pershing into Mexico in an unsuccessful attempt to capture or kill Villa. 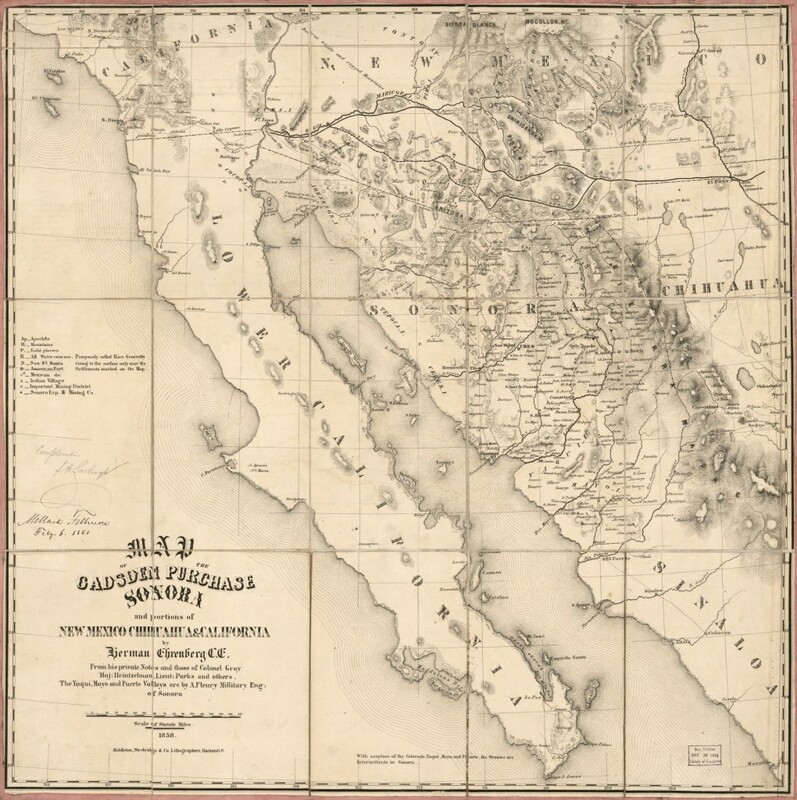 In response to rising tensions along the international boundary, American authorities mustered the Arizona National Guard and other border state forces into federal service. 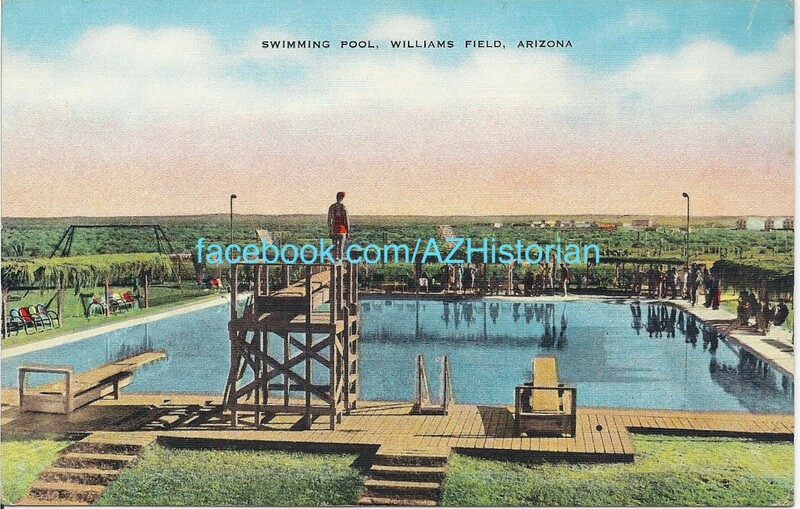 Arizona National Guard troops were federalized on May 9th, 1916 and sent to serve at Camp Harry J. Jones near Douglas and nearby Camp Naco, among other locations in the state. The Arizona National Guard’s “border trouble” era service ended with their call to train for, and eventually deploy to, France as part of America’s World War I forces. A 1917 Clifford K. Berryman political cartoon depicting a personified Germany carving up the United States after a never-to-materialize victory over America and its allies. Veterans Day originated as a remembrance of those who fought in World War I, once known as “The War to End All Wars.” While America eventually mobilized more than 4.5 million soldiers for the conflict, strong isolationist sentiment delayed U.S. involvement for some time. However, popular resistance to the war softened following the loss of 128 American lives when a German U-boat sank the British ocean liner Lusitania in 1915. Further provocation came in the form of an upsetting German diplomatic cable promising Mexico, a potential Allied foe, a sizable swath of American land as a spoil of war. The words quoted at the top of this post were included in the controversial January 1917 telegram sent by German Foreign Minister Arthur Zimmerman to his country’s diplomatic delegation in Mexico. This correspondence, an attempt to draw Mexico into warfare with its northern neighbor should the United States join the fray in Europe, sparked nationwide outrage and helped to bring about American participation in the Great War. Having enjoyed statehood for just five years, many Arizonans understandably reacted to Germany’s proposal with great alarm, as evidenced by statewide press coverage of the matter. An article from the March 1st, 1917 Bisbee Daily Review newspaper announcing the Mexican government’s supposed preference for war with the U.S., the possibility of German U-boat bases, armaments, and troops having already been placed in Mexico, and what was reported as the likelihood of Mexico ending oil sales to the United States typifies the fear and excitability found in Arizona papers at the time. Ultimately, the United States did enter World War I against Germany, but did not have to contend with the military force of its southern neighbor – although American forces were then engaged in numerous skirmishes along our border with Mexico, albeit for unrelated reasons. 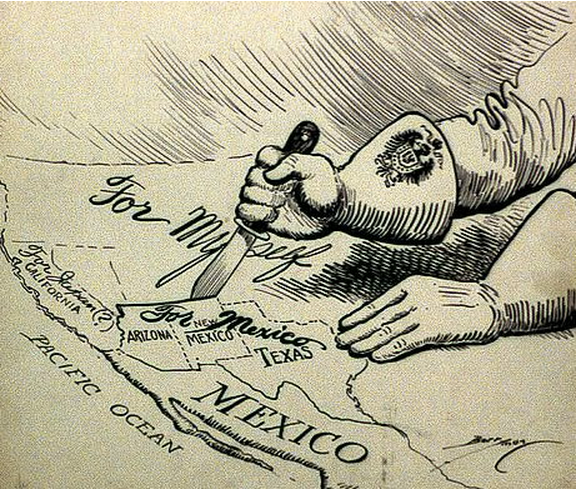 Allied victory in the First World War ensured that Mexico would not regain its former territory in the southwest U.S., even if it had chosen to join forces with the Kaiser’s once-mighty army.